The Short Days are Numbered. Fall has fallen. 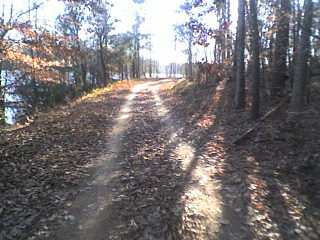 Bare trees and leaf covered trails make the ride around Salem Lake completely different. Favorite lines are now hidden, and incidentally, so are the rocks. 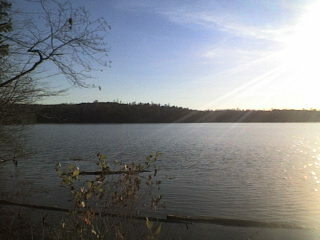 Great day for riding, though. It’s getting dark at 5 and lights are on by 5:30. The solstice is coming, boys. Traveled to Dobson to watch the state CX championship. Very strong riders. Randy Shields (Masters 45) covered a start gap of 30 seconds or so and caught the lead group of the 35 Masters. I guess he’s getting ready for Nationals. New Winstontonian Jared Roy of Crossniacs and The Wah Report took the 35 Masters Gold by tactically playing his cards right and attack at the top of the last hill and stayed away for the finish. Great Job, Jared!